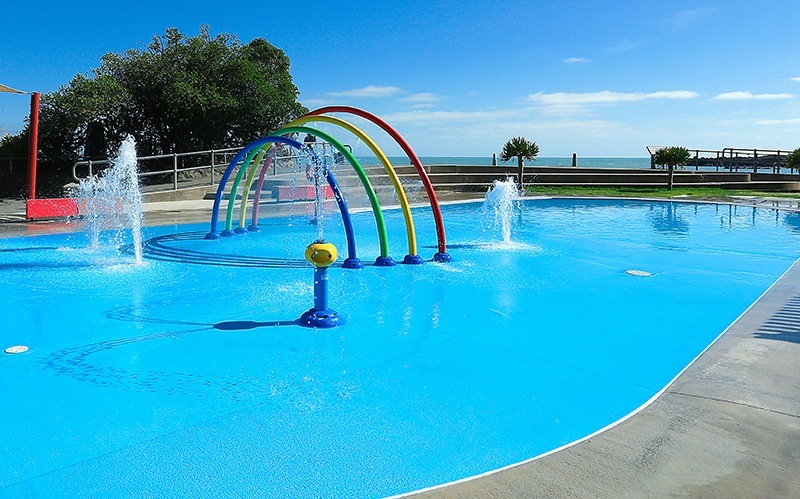 Wave pools, wet playgrounds, splash pads and similar water features require a great deal of creativity, flexibility and innovation. Natare offers complete design solutions for aquatic recreation and a wide range of products that address the particular needs of these unique facilities. Natare has been involved in nearly every type of swimming pool construction and water feature project imaginable– from covering an entire mountain (amusement park attraction) in PVC lining, to building an indoor water park wave pool on the 12th floor of a resort, Natare has pretty much done it all. Safe, comfortable, waterproof flooring in a variety of colors, suitable for any aquatic environment. Strong, durable PVC lining and waterproofing system for construction or renovation projects. WaveFlo perimeter systems are designed to accommodate highly turbulent water conditions. Download more information to aid in the planning, design and purchasing of your water feature, wave pool or wet playground. There are no files currently available for download in this category. Learn more about our products and how we can customize for your facility.